This dish is great as a starter or as a main with a nice salad and garlic bread. 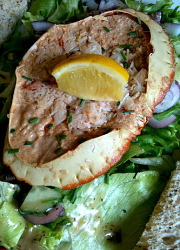 Put all the crab in a bowl, mix well with half a lemon, chilli powder and freshly ground pepper. Portion out in a ramakin with room for the Cheese sauce. Mix milk and 200grms Cheddar cheese until melted over low heat. Thicken with the corn flour and add more cheese to taste and ground black pepper. Pour over crab and top with grated cheese. Put under a hot grill until cheese is bubbling, serve straight away with garlic bread and side salad. Enjoy!